Other than the increase in strength, the best improvement has been in my flexibility. My hamstrings were extremely tight. The added flexibility has made everything easier! The bending and stretching while working in my garden is no longer an issue making it a more enjoyable experience. When I first started working with Body Within I was overweight and smoked. Originally I worked with Chris to show me the correct way to lift weights and maximize my workouts. Over the next several months not only did I learn proper form and technique, but I also lost over 20 pounds, reduced my body fat by 6% , quit smoking, lowered my cholesterol, and strengthened my lower back. * As far as the cost it is the best money one can invest in themselves! When I was in my late twenties, I was diagnosed with a rare hip disease that caused me so much pain and I lost 20% mobility in my left leg. My husband is a U. S. Naval Officer and we were stationed overseas in the Philippines at the time. I had to wait over a year before we were transferred back to the United States before I could have hip surgery. I was told I would eventually have to have another surgery to replace my hip, but that I was too young at the time to have one. During the years after that initial surgery, I developed other joint issues from compensating for a compromised hip and had to have two knee surgeries as well. 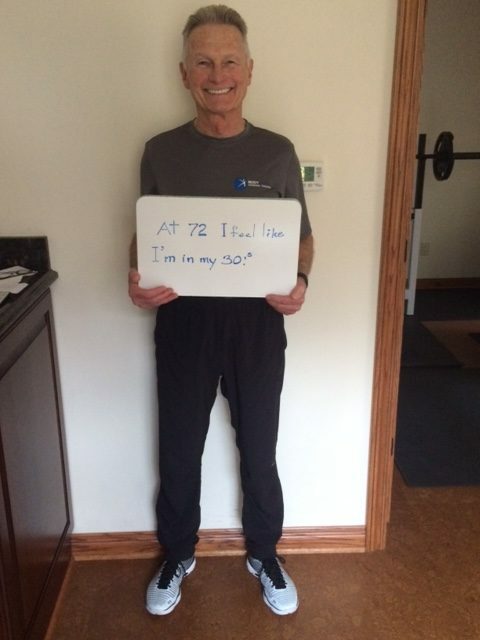 Twenty-eight years after my initial diagnosis, I had my hip replacement in 2010. After seven months of physical therapy and rehabilitation, I was released from therapy. I really didn’t feel that I was ready to start exercising on my own because I didn’t want to do anything to cause any problems with my newly repaired hip. This is around the time that I met Chris Schilds and decided that my husband and I should start personally training with his team. Chris did a very thorough evaluation of our abilities and we started working out together with his wife and co-trainer, Jenny. 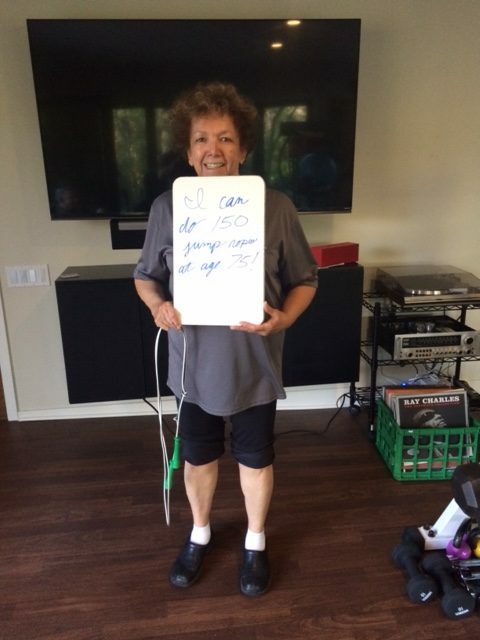 When we first started, I couldn’t barely do 5 pushups even from a standing position from our pool table. After working out with the trainers at Body Within, I recently took a trip to Waikiki, HI with my husband. Six days prior to my 55th birthday and two years post hip replacement, I climbed Diamond Head. To me this was a HUGE accomplishment because there were very steep stairs and rocky switchback paths I had to climb. Prior to my hip replacement and working out with the professional trainers at Body Within, I could barely make it to the end of my driveway using a cane in order to get the mail out of my mailbox. Now, I climbed a mountain! I also was able to ride a horse along the sandy beaches of Waikiki and I snorkeled off a catamaran in the open ocean. These are activities that I would never have attempted before training with Body Within. I feel stronger, younger and more alive than I have ever felt before! 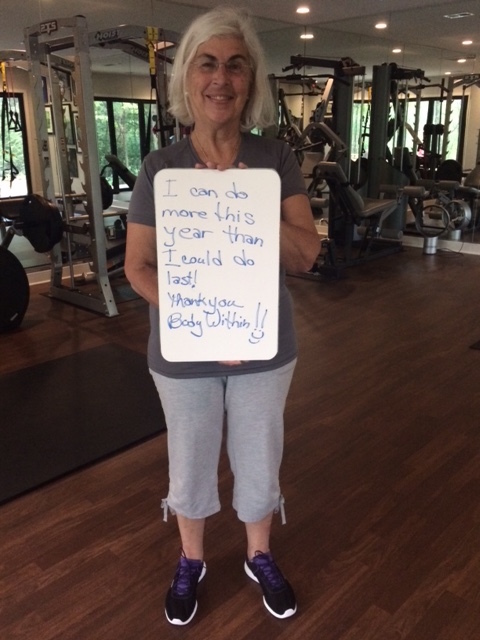 Thank you Body Within trainers! Body Within is punctual, accommodating, professional, and results driven. Thank you! You have shown me that I am stronger than I thought I was. You have shown me how to move from couch potato to an active lifestyle. You have shown me that I can utilize the equipment I already own to create a challenging workout. You have shown me more ways to do crunches than I ever thought possible! You have proven to me that I really do feel better with a workout schedule in my life than without one. Thank you again for your commitment to me. Dave and I started looking at pictures of ourselves in February and we realized that we needed to start losing weight. Having had two babies within the past three years, we’d gotten ourselves into a rut of just eating whatever was the quickest and not paying attention to what it was that we were eating. Before we knew it, we were both up to 210 pounds (at 5’7) and knew that something had to change, not just for ourselves, but for the health of our children as well. While we have tried dieting before, we lacked the accountability, the drive, and the knowledge to transition from dieting to truly changing our lifestyles. We saw an ad for Body Within in one of the home mailers and decided to give them a call. Chris came out and gave us an initial consultation, and from the first meeting, we knew that he was going to be the one to help us meet our goals. Dave and I worked out together with Chris, who gave us each our own workouts based on our fitness goals and abilities. Before we knew it, we were getting stronger. Chris kept track of our progress and gave us that accountability we so desperately needed to ensure we were watching what we were eating and staying on top of our workout routines. Within four months of working with Chris, I lost 45 pounds and about 4% body fat, while Dave lost about 20 pounds and 5% body fat. * We can honestly say we’re in the best shapes of our lives, and we couldn’t have gotten here without Chris and Body Within. The lifestyle changes he has helped shape for us and our family are ones that we could never thank them enough for! Body Within is awesome! Their unique approach to training has made a huge impact on my son. We see the results not only physically, but emotionally as well. His confidence has soared and it is fun to watch this transformation. They keep it interesting and fun for him and for a young boy/man that is crucial. Thanks for everything! On a professional note I am a massage therapist and with that comes a lot of upper body work for me. There are times when I have to work on a client and do deep tissue massage which can be very intense. I don’t think that I could complete this and do a great job without the help of Chris and Body Within.